Sail the island’s of Hawai’i on board the Kanaloa, the ultimate in luxury sailing. 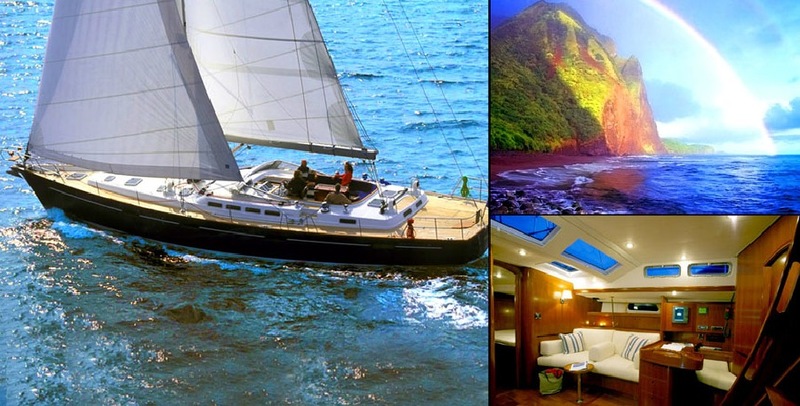 The Kanaloa is a 57’ Beneteau sailing yacht, it is impeccably maintained and privately owned. The Kanaloa is available for private charter for 1/2 day, full day, and extended overnight excursions. Our professional crew will attend to your every need while you sail Oahu, Kauai, or Maui. We will tailor your sailing experience to your specifications or choose from one of our all inclusive luxury packages. Indulge in a sunset dinner cruise catered by one of Oahu’s finest private chefs, a full day of taking in the breathtaking Oahu coastline with gourmet lunch included, or snorkeling or fishing off the boat with friends and family. To the east and west lie the scattered islands of the Hawai’i chain: tiny fragments of heaven washed by azure seas. Oahu, Kauai, Maui, and the Big Island share a relaxed tropical lifestyle but each has its own ambience. Experience one, two or all four. If you are looking for the best places on earth to bask on a white-sand beach, snorkel in sapphire lagoons or lie on deck listening to the waves ebb and flow, you’ll find them here. Board the Kanaloa and indulge yourselves in the ultimate in luxury sailing. 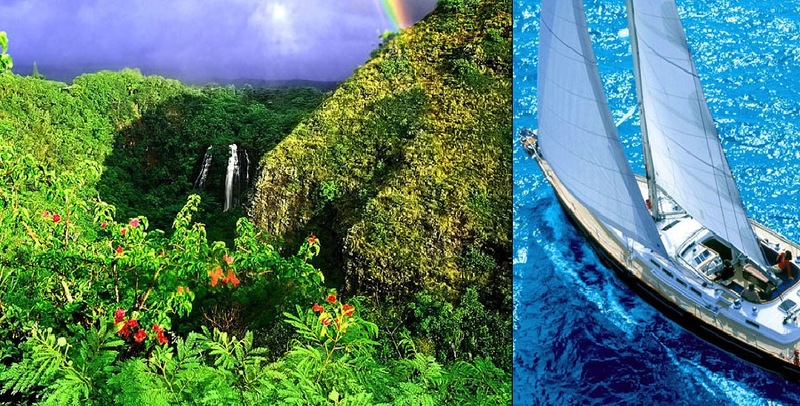 Experience the beauty of the Hawaiian coastline from the deck of Hawaii’s most exquisite sailing yacht. The Kanaloa, a 57’ Beneteau vessel, is fully appointed with all the accoutrements required to pamper you and your guests as you glide effortlessly through the serene Hawaiian waters. Private charter sailing is the most relaxing and intimate way to experience the beauty of Hawai’i. 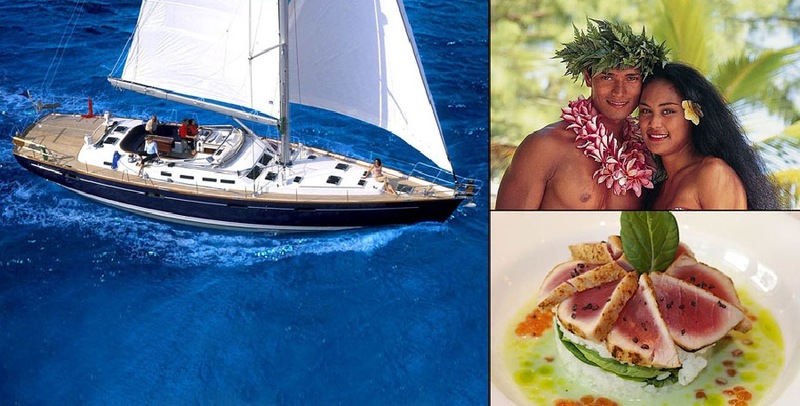 For those who appreciate privacy, fine food and wines, and breathtaking views, board Hawaii’s most luxurious sailing yacht, the Kanaloa, for an experience like no other. Specialty charters cater to your unique interests. Whether you choose to savor the finest in Hawaiian cuisine while skirting the coastline at sunset or you prefer to take an extended sail to one or more of the neighbor islands, we will create an experience tailored to your specifications. On board the Kanaloa nothing is too much trouble. From the moment you are welcomed aboard to the moment you dock you’ll be in the very best of hands, on the very best of Hawaii’s sailing yachts. The itinerary and the pace are yours to decide. We will create the experience that you request, at your pace, and at your chosen destination. We provide snacks and non-alcoholic beverages. Private Chef catered meals are available at an additional charge. The Kanaloa is equipped with a fully functioning galley. Place yourself in our care and discover a luxurious and exclusive way to travel that offers unprecedented comfort and service while sailing the azure seas of Hawai’i.